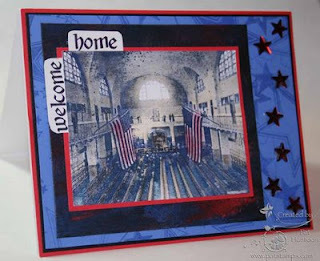 Today's Blogger's Challenge was to create a card for Labor Day or a Red, White and Blue item. Labor Day is dedicated to the social and economic achievements of American workers. It constitutes a yearly national tribute to the contributions workers have made to the strength, prosperity, and well-being of our country. This led me to think about the American Workforce...and where most Americans are from. Thus the creation of my Red, White and Blue Ellis Island card. The Ellis Island Stamp (The Stampsmith) was stamped in blue ink and colored with chalks. That is layered on a black piece of Pearly Gel, one of the Bonus Techniques from the upcoming Technique Junkie Newsletter. 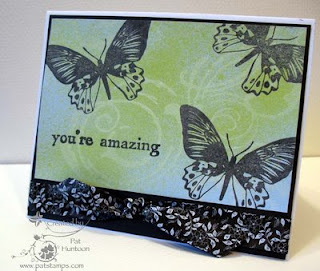 This piece is layered over a stamped star Background (Stampin' Up! Jumbo Wheel). I added some crystal stars and the "Welcome Home" words (Club Scrap) to finish the card off. I hope you enjoy the labor day weekend and holiday. Today's Technique Blitz a bonus technique is from the soon-to-be-released Technique Junkie Newsletter 6th edition CD. The centerpiece of this little necklace was made using the Faux Dichroic Technique -- I just love how this turned out! It took me longer to string the seed beads than to make the pendant. The CD has over 80 techniques on it -- each in step-by-step format with pictures for each step. The tutorials are formatted to print easily on 8-1/2" x 11" paper and are in .pdf format. CDs are $14.95 for subsccribers or $19.95 for non-subscribers. You can receive the CD and one year of the newsletters for only $29.95! Email me to reserve a copy today! 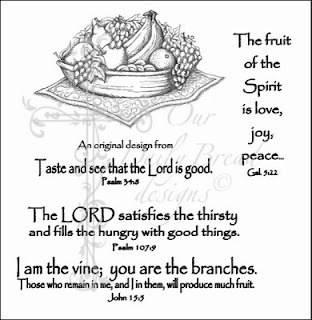 All Our Daily Bread Designs stamps come to you in a box. They are not mounted on Wood -- but they are beautifully cut and are pre-mounted on cling mount. Just stick them on an acrylic block and stamp away! Okay, so how do you enter this giveaway? ANYONE can enter this give away.One entry per person, per give away, please. To enter the give away for today, simply leave a comment on this blog entry telling me that you would like to enter by 11:59pm EST on Sunday, August 31st. No other entry methods will be included in the give away. If you email me to enter, your entry will NOT be considered a valid entry. When you leave the comment, make sure to put your NAME in the comment -- if you enter your comment as "Anonymous", I cannot give you the prize! Blogger does NOT record your email address for me, so you will need to check back to find out if you have won or include your email address in your comment so that I can notify you. A good way to do this is like so: phuntoon at optonline dot net -- it will help protect your privacy! I will have a random number generator pick one number from the comments to select one winner. Each give-away is separate, so to be eligible for a specific item you must enter that day's contest on the post where it is listed. Enter today -- good luck! I have blog give aways every Wednesday -- come play! Congralations to Karen Maxwell, the winner of this giveaway! I used the Glowing Image Technique for the main image here, and then used the Pearlized Gesso Technique for the Background. Both techniques are from the August 2008 issue of the Technique Junkie Newsletter. I stenciled a little red ink over the gessoed pearls just to make them a little more "flourishy." It's a little hard to see, but the eyes and teeth were colored with a glittery marker -- and the red stars along the sides are crystal. For some reason I just couldn't get all the shimmer, shine and glimmer to show in any of my pictures. My 15-y/o son told me that this card is HOT... When you are making teen cards, there is no better compliment! Today's Technique Blitz uses the Bandanna technique from the August 2008 issue of the Technique Junkie Newsletter. Aren't these just great stamps to use for this technique? All stamps from Innovative Stamp Creations. My baby boy is 15. 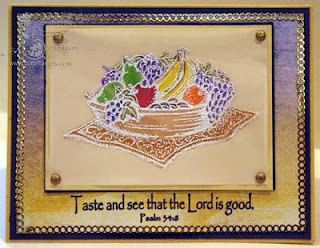 This simple Pearlized Gesso card (August 2008 Technique Junkie Newsletter) was made for him. He is totally awesome, and I didn't need to add alot of fru-fru to tell him so. My background was made on black, with a cool result, I think. I know he will like it. So happy birthday to you, my 6'4" 15 year old gorgeous baby boy. Designer Tiles -- with a twist! Instead of designer paper, I stamped my paper and used the stamped paper with plain paper. I love this twist on this great technique from the August 2008 issue of the Technique Junkie Newsletter. My sock monkey was colored with the Marker Watercoloring Technique from the June 2008 issue of the Newsletter. Really. No stretch on that one! Make sure to watch Mary Jo's blog for the other players, and thanks for stopping by! You know how some stamps just "speak" to you? 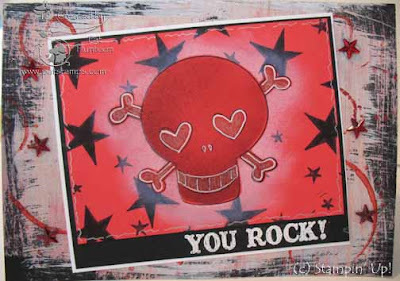 These stamps from Firecraker Designs by Pamela do that for me. I always feel such a great sense of relaxed serenity when I use these stamp. I know it kind of sounds silly to say it out loud, but these stamps just have that effect on me! 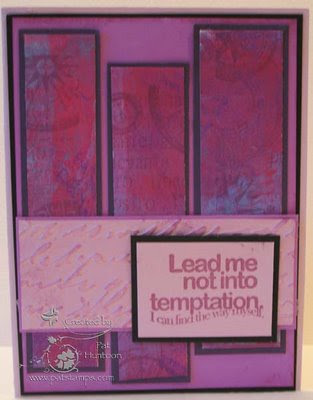 In any case, this card for the Technique Blitz uses the Pearlized Gesso Technique from the August 2008 issue of the Technique Junkie Newsletter. These are appropriate stamps for today because I am on vacation (yes again! ), This time we are at the beach with DH's family on Cape Cod. This is a vacation that I look forward to every year -- beach, sun, family...relaxation. Couldn't be better! Valerie is in my office this week, though, and I do have an internet connection this time, so email me if you need to...and have a great week. The Technique Blitz shall go on! 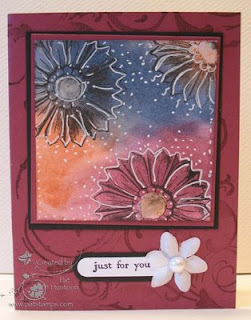 Today's Technique Blitz card uses a Painted Pigments background, a technique from the August 2008 issue of the Technique Junkie Newsletter. I stamped a collage stamp over the pigments with a dark grey inkpad and added a cuttlebugand greeting layer to finish the card. Today's Technique Blitz card is also my weekly card for Blogger's Challenge#60. First, the BC part: The challenge today was to create a Birthday card. No other restrictions -- just a birthday card. 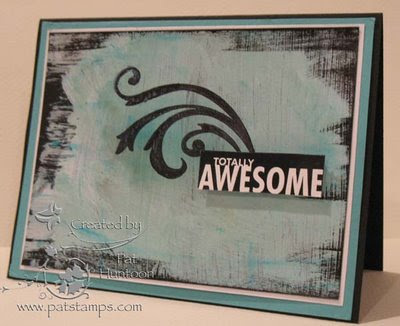 I chose these fun stamps from Artistic Outpost from the Polaroid Cutie stamp sheet. I think she is just adorable! Now, the technique part : ) The background of this card is a Painted Pigment background, from the August 2008 issue of the Technique Junkie Newsletter. My girl was stamped on white, then colored lightly with pastel chalks. Add a ribbon, a little layering, and Viola! Fini! Take a minute to enjoy the artwork from the other Blogger's Challenge players -- you can find them by clicking on the logo on my sidebar. Happy Friday! Today's Technique Blitz card features a shimmering resist creation, one of the Techniques from the August 2008 Technique Junkie Newsletter. I tried to capture some of the shimmer in the photo, but I don't think it shows well. Great shimmer here, though! Wonderful Wednesday Giveaway -- Storage Units, Inks and More! I am so excited to bring you a fun new participating company in the Wonderful Wednesday Giveaways! Today, the Giveaway set is from Storage Units, Inks and More. Many of you may be familiar with this great company because of the outstanding storage units they have been providing to the stamping community for years at SUInks. 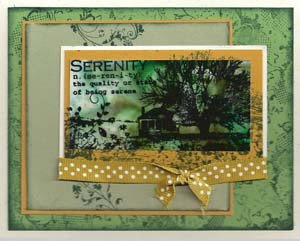 Denise Wenzloff, the owner, just recently started to offer a new line of clear stamps that are wonderful! The card on the right (you didn't think I forgot the Technique Blitz, did you?) uses the Alcohol Ink Technique from the August 2008 issue of the Technique Junkie Newsletter. All of the images were colored this way, then layered over a polished stone background. The girl, the beach ball, and the float are all raised with pop dots. One of the things I love about clear stamps is the ability to place the stamps anywhere on the paper and see exactly where you are stamping. it makes lining up words around edges incredibly simple and exact, as I did in the example above. Storage Units, Ink & More opened its online store on July 1st. Since then, Denise and Bob Wenzloff have had an overwhelming response to their products. 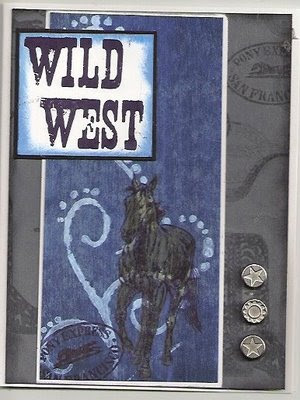 Storage Units, Inks and More have 2 great illustrators designing the new line of clear photopolymer stamps, a partnership with a great cardstock company: Core’dinations, AND is the exclusive distributor of color matched inkpads. Check out the website for the full line of products. Storage Units, Ink and More has also made up some COMBO PACKS. You'll find them at the bottom of the Stamp Set page, the Copic Marker page, and at the bottom of each of the Inkpad pages. We can all use a deal, right?! And don't forget that they design and manufacture INKPAD STORAGE UNITS at their sister site: www.SUInk.net. Soon there will be a new unit made specifically to house their own line of inkpads and reinkers. ANYONE can enter this give away.One entry per person, per give away, please. To enter the give away for today, simply leave a comment on this blog entry telling me that you would like to enter by 11:59pm EST on Sunday, August 17th. No other entry methods will be included in the give away. If you email me to enter, your entry will NOT be considered a valid entry. When you leave the comment, make sure to put your NAME in the comment -- if you enter your comment as "Anonymous", I cannot give you the prize! Blogger does NOT record your email address for me, so you will need to check back to find out if you have won or include your email address in your comment so that I can notify you. A good way to do this is like so: phuntoon at optonline dot net -- it will help protect your privacy! I will have a random number generator pick one number from the comments to select one winner. Each give-away is separate, so to be eligible for a specific item you must enter that day's contest on the post where it is listed. Enter today -- good luck! I have blog give aways every Wednesday -- come play! Congratulations to Gina Wrona, the winner of this set and card! Today's Technique Blitz uses one of the bonus techniques from the soon-to-be-released 6th Edition CD. This technique, called Mirror Stamping, is one of 10 techniques that can only be found on the CD. Thank you to Manna Caffrey for this one! It is very hard to capture a good picture of anything reflective, so I hope you can see these clearly. I know it is a little strange to see a fall card in the heat of August -- but it has been so refreshingly cool here this week that I just felt a bit autumn-ish. It will get hot again, I am sure, but in the meantime, here is a cool little pumpkin! 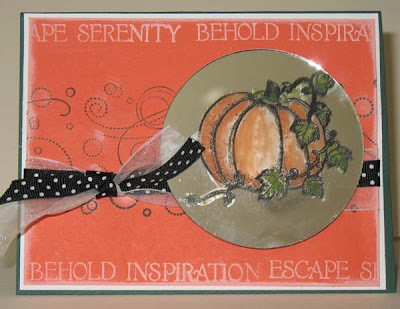 The pumpkin stamp is from Innovative Stamp Creations, the wheel is from Stampin' Up!, and the words around the edges are from Club Scrap. Today's Technique Blitz card uses the Roll with the Punches Technique from the August issue of the Technique Junkie Newsletter. It also happens to be my submission for today's Technostamper Sketch Challenge (#30). I used a Wheel called "rough texture" -- it is a little hard to see from the picture. 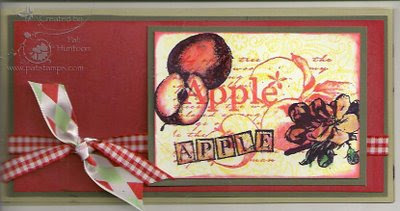 The stamps, punches, paper and hardware used here are from Stampin' Up!. The ribbon is from Really Reasonable Ribbon. Today's Technique Blitz card uses the Acetate Swirl Technique -- one of the 10 CD-only Bonus Techniques from the soon-to-be-released 6th Edition CD from the Technique Junkie Newsletter. 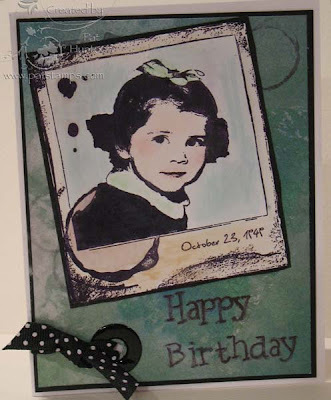 The stamps used here are from Artistic Outpost. I was looking to achieve a spotlight effect from my piece. The 6th Edition CD has all of the issues from the Technique Junkie Newsletter from the October 2007 through the August 2008 issue. Each of the techniques are presented in step-by-step tutorials, with pictures for each step. There are plenty of artwork samples for each technique, too. Oh, did I mention that the tutorials on the CD are designed to print nicely onto an 8-1/2" x 11" piece of paper? Or that the CD has 10 bonus techniques that are only found on the CD? Pre-orders for the CDs are $14.95 for subscribers, or $19.95 for non-subscribers. Subscribers can renew for one year and purchase the CD for $29.95 (until October 1st). You can become a subscriber for the next year, and pre-order the CD for the same price, too. All CDs will be released in September. For Today's card in the Technique Blitz, I present to you a 15 minute card. 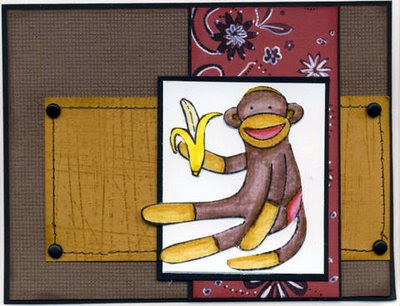 This card is a Designer Tiles Card from the August issue of the Technique Junkie Newsletter. I love quick and easy cards, don't you? 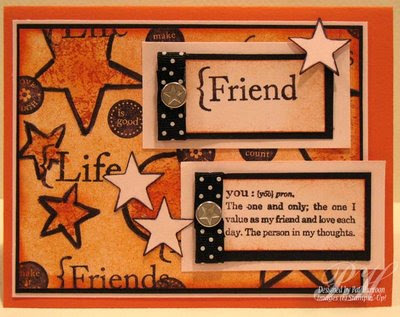 All stamps and paper by Stampin' Up!. Technique Blitz, TSSC and Blogger's Challenge! 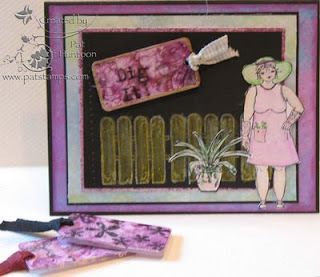 Second, today's Blogger's Challenge (59) is called "the same, but different" -- were we challenged with using a sketch of our choice to make two different cards with two diverse colors and stamps. I used MJ's sketch! The second card, on the left, uses the Bandanna Technique from the 8-08 TJNL. These stamps are from Innovative Stamp Creations. Just love this stamp with that technique! Okay, 'nuff for today... Check out the other Blogger's Challenge players by clicking on the logo in my sidebar. Have fun browsing! I specifically bought these stamps at a stamp convention in JUNE and I figured it was high time I used 'em! These pretty stamps are from Chapel Road Artstamps. I just love this style of stamp - I find them elegant, yet strangely soothing. Kind of like a good cup of tea, if you know what I mean. 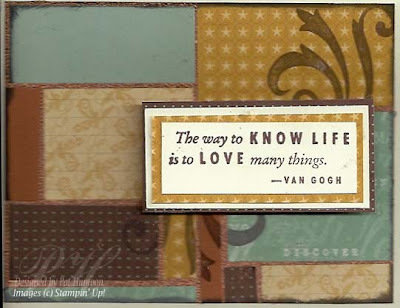 In any case, today's card uses the Layered Collage Technique from the August '08 issue of the Technique Junkie Newsletter. 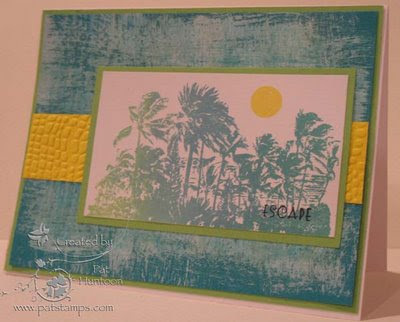 This is a collage technique that should appeal to both experienced and new stampers alike. Have you tried it yet? Hope your day was fun and full of new stamping techniques -- oh wait! That was my day! 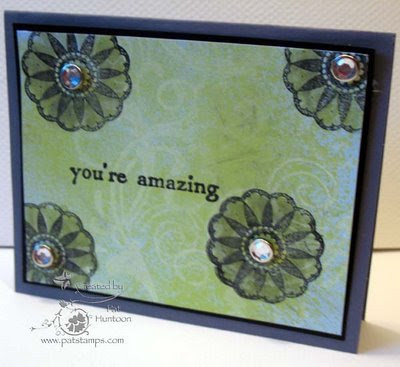 I have another sneak preview today for the Technique Blitz, using these wonderful giveaway stamps from today's giveaway sponsor, Firecracker Designs by Pamela. The sample card shown on the right uses a variety of techniques (what is the point of publishing over 400 of them if I don't use them, right?). First, and foremost, the "Dig It" tag uses the Glimmer Mist Technique from the soon-to-be-released CD 6th Edition (click for details -- pre-orders started this week). Sally, our garden girl, was colored using the Gamsol Pearls Technique from the June 2006 TJ Newsletter; she is standing in front of a fence that was colored using the Pencil-over-Ink Technique from the March 2005 issue. I layered all that on the green Simple Green Spritz background (April 2008 NL). 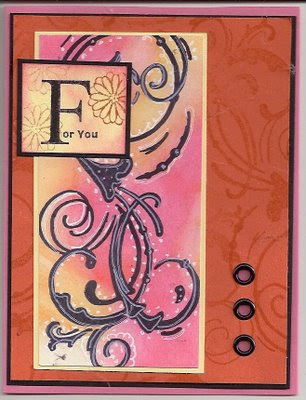 THAT is layered on top of a Painted Pigments background from the current August 2008 Newsletter. Enough techniques for ya'? I think I counted 5. Whew. The set I took all these wonderful stamps from is our giveaway set (on the left). These fun stamps from Firecracker Designs by Pamela gave me a ton of options! 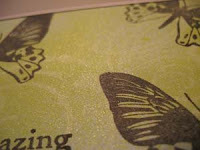 I even made those two little Glimmer Mist Tags in front of the card -- those will be given to the giveaway winner, too. Of course, Pamela has alot going on, too! FIVE new sets for August!! 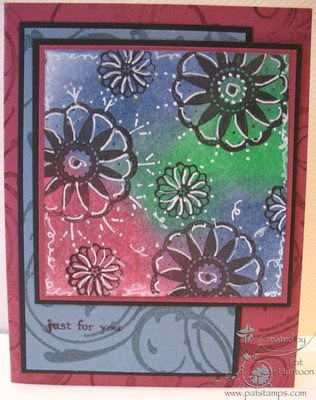 Daisies, Karaoke/Singing Star, 2 Silhouette Sets: Bridge of Thoughts, and Flowers, and a 8.5x5.5 set called Teen Chat! !To see them all click here.To see some wonderful new art with these sets, click here! For a limited time, when you buy Bridge of Thoughts, you will get a special offer to buy Silhouette Flowers at 30% off, at check out!! CD cases are back in stock!! Click here! Of course, TJer's always have a discount coupon!! Just type in ILOVETJS in the coupon box, and save 10%!! 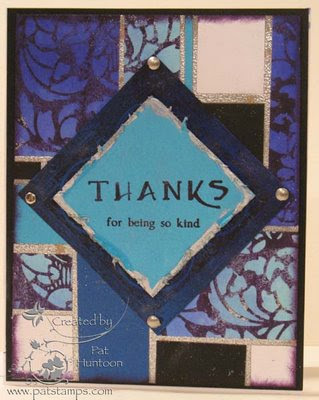 Make sure to stop by Pamela's website or her gallery and blog to thank her for generous support with the giveaway! Want to know how to win this set, the Glimmer Mist Chips and the card? ANYONE can enter this give away.One entry per person, per give away, please. To enter the give away for today, simply leave a comment on this blog entry telling me that you would like to enter by 11:59pm EST on Sunday, August 10th. No other entry methods will be included in the give away. If you email me to enter, your entry will NOT be considered a valid entry. When you leave the comment, make sure to put your NAME in the comment -- if you enter your comment as "Anonymous", I cannot give you the prize! Blogger does NOT record your email address for me, so you will need to check back to find out if you have won or include your email address in your comment so that I can notify you. A good way to do this is like so: phuntoon at optonline dot net -- it will help protect your privacy! I will have a random number generator pick one number from the comments to select one winner. Each give-away is separate, so to be eligible for a specific item you must enter that day's contest on the post where it is listed. Enter today -- good luck! I have blog give aways every Wednesday -- come play! Congratulations to Lori Stilger, the winner of this giveaway!!! Sometimes a technique comes along that really "catches my fancy." This is one of those: Shimmering Resist from the August 2008 issue of the Technique Junkie Newsletter. I LOVE the subtlety of the resist combined with the soft shimmer. My favorite part of this technique is that it gets better as it dries! The resist portion really pops out...and the shimmer stays put. Unfortunately, it is hard to catch the shimmer in a scan or picture, so if you are Technique Junkie, you will just have to try it yourself. I tried to catch a glimpse of the shimmer, below, so you will have to trust me! Today's art for the Technique Blitz features the Bandanna Technique from the August 2008 issue of the TJ Newsletter. I think this technique is so much fun -- it really allows you to break free and just doodle! I love the color intensity of the backgrounds, too. Hope you like this one!